Krishna Janmashtami is observed on the eighth day of the dark half or Krishna Paksha of the month of Shraavana in the Hindu calendar, when the Rohini Nakshatra is ascending. Sri Krishna is Lord Vishnu’s eighth avatar (incarnation) on earth. The main object of this incarnation of Vishnu as Krishna, was to destroy the cruel King Kansa of Mathura. Kansa, the king of Mathura was a very cruel tyrant. His tyranny spared no one, even the sages had to bear the brunt of this. Finally the Gods could tolerate no more and in a dream Kansa was told that his evil reign would be brought to an end by his sister Devaki’s son who would kill him. The cowardly tyrant immediately threw his sister Devaki and her husband Vasudev in prison so that he could kill all the sons born to Devaki. In captivity Devaki bore six sons, each of whom were promptly killed by Kansa. However, the seventh child was transferred miraculously from Devaki’s womb to the womb of Rohini, who had desired a child of her own. The child was formally named Rama, but because of his great strength he was called Balarama (Strong Rama), Baladeva or Balabhadra. Thus, Rohini actually gave birth to Balarama and raised him. Thus Balarama’s other name is also Saṃkarṣaṇa which describes the transfer of the child from the womb. When Devaki gave birth to her eighth child, the newly born baby changed himself into the form of Vishnu and commanded Vasudev to carry him to Nandgaon and place him besides Yasodha. That night the prison guards fell into a deep slumber and the doors were unlocked. Taking advantage of this opportunity, Vasudev slipped out of the prison and whisked away the God-child to the safety a neighboring kingdom which was ruled by king Nanda. King Nanda’s domain lay across the Yamuna river. At that time the river Yamuna was high, but when Baby Krishna’s feet touched the waters , the waters parted making a channel for Vasudev to pass. He was also asked to bring back the baby girl whom Yashoda had delivered. The generous king Nanda gave away his new born daughter to Vasudev knowing fully well what fate awaited her at Kansa’s hands. Vasudev brought back the baby girl. Seeing the baby girl, the enraged King Kansa smashed her on the wall but she escaped his hands and flew away to heaven announcing -“Beware, your killer is alive”. At Gokul, under king Nanda’s protection, Krishna got the loving affection of King Nanda’s Queen Yashoda whom Krishna looked upon as a mother. 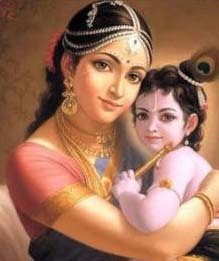 Days passed with fun and frolic, while the child-Krishna grew up. Krishna grew up happy in Nandgaon amongst cowherds. His flute-playing enthralled the young girls or “gopis” who danced around him. The cows gathered with his sweet flute playing. But one day rumors reached Kansa that Devaki’s son had somehow escaped his clutches and was living in Gokul. Krishna was ideal in all his human relationships – a darling son to his parents, an endearing friend and comrade, a devoted disciple, a loving husband and a trusted brother. There are many stories that tell about his superhuman qualities and mystical achievements. In spite of this Sri Krishna never appeared distant to any of his fellow human beings, in fact he was dearer to them than their own nearest kith and kin. The shadow of his greatness never marred these bonds of the heart. To the Hindu, he is the supreme statesman, warrior, hero, philosopher, teacher and god himself.